If you have to spend time on one presentation about the topic, this one is my recommendation. If you want the juicy inside story about the Lakewood scandal, or a whitewash of it, or a jeremiad against the system, or an analysis of the hopelessness of the tuition crisis, then skip it. But if your instincts tell you that it is better to follow the traditional Torah path in times of crisis – doing soul-searching rather than finger-pointing – then listen to this recent shiur by my good friend Rabbi Moshe Hauer in Baltimore. It is full of sincerity, integrity, insight and sound advice. It will not solve the crisis overnight, but it will reassure you that there are good people in the Torah world who still have their heads screwed on right. What “crisis”? A few people (maybe 20 or so) cheated on welfare benefits. Why is that such a big deal? Aren’t there 50,000 frum yidden in Lakewood? It is a big deal because we all know that convictions in the US are just the tip of the iceberg of the number of unlawful acts. See how Special Prosecutors when they gave the resources will find things. 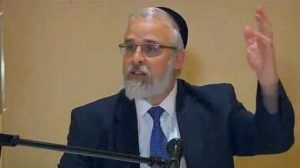 Thanks to your blog I saw Rabbi Moshe Hauers speech, it was linked to a comment on a prior post. It was very much worth the time listening to him. The acid test will be how often schools teach the requirements of being honest in dealing with non Jews and Jews compared to learning brachot. Rabbi Haber gave a terrific and important speech, but, despite speaking for over an hour, I’m afraid that he, too, missed the elephant in the room. We are not educating our children to make parnassah. We are not giving them the tools to earn more than minimal wages in the work force, al pi derech hateva. It’s bad enough that college is verboten. But now, even at the mesivtah high school level, we have minimized secular studies or dropped them altogether. We have created a society where we are very much “somchin al hanes” to expect so many undereducated people to overachieve financially to the extent needed (much less wanted) in the frum world. Several commenters on your previous piece pointed to the great numbers of people who went through the yeshiva system and nonetheless found great financial success in the business world. I also know some of these people personally. Nonetheless, the number of people who struggle to pay their bills month-to-month far outweighs the number of people who are flush financially. The wealthy are outliers; the struggling families are the norm. I’m the first one to admit that a college education and a college degree offer no guarantees. And there are a number of vocational skills that may be a more reliable foundation for supporting a family. I’m also well aware that the job market today is built on shifting sands and it is difficult to prepare for employment knowing that. Nonetheless, we have to take steps to prevent the current situation where people come out of kollel at the age of 30-something, with five children, many bills and no REASONABLE employment prospects. Not everybody is cut out to be a kollel member or an independent professional, entrepreneur, or merchant. Just as Jewish education is best when it fits the individual student’s needs and aptitudes, so, too, is the vocational education of Jews and the age to begin it. One size does not fit all. The genius of the American system, what remains of it, is in allowing for multiple, diverse, localized initiatives to make economic decisions and solve economic problems, instead of large-scale, centralized dictation to the “masses”. Once again, it appears that we are kindred spirits as you are hitting on the core point. While it’s important to live a life of yashrus in one’s business dealings, with all of the behavioral and attitudinal aspects, how does one get to the point to be in a position to be able to do that? Before about 30 years ago, the path to parnassa followed by those in the Yeshiva community happened organically and early. Kids went to school, got a decent balanced education of both Limudei Kodesh and Chol. Based on interests, acumen, and parental influence/encouragement, they embarked on a post high school combination of Yeshiva and college. There were no other cheshbonos than that. The objective was to continue one’s life as a responsible Ben Torah and Baalabus, without the holy grail of Kollel or indefinite learning. And that was OK and it worked. No one needed the validation which came from labels and being able to name-drop popular Yeshivos. College did not need a top-down “heter” from a Rosh Yeshiva or Rebbe, and common sense did not need a haskama. People simply did what they needed to do and ultimately became the foundations of the communities and notable mosdos that every takes for granted today. Removing all of the above from the equation, we are left with an underclass of 30-something families with great financial needs and have to function in society. Secular education has somehow become an evil, necessary or not, which has been belittled, minimized, or eliminated. So, the 32 year old father with 5 kids who has not had a serious secular class since 5th grade is now expected to compete in the general job market. The competition are the others who have used the past 20+ years to study English, Math, Technology, and Science. They go on to recognizable degrees and build a resume of experience to put in front of a hiring manager. Yes, maybe there are those in the privileged minority who will have a job held or created for them by a father or father-in-law after having been the beneficiary of their collective financial safety net. Or the scrappy degree-less entrepreneur who makes it big in business and is now a visible supporter of the Yeshiva. We all know that guy. He is the exception whom all of the Rabbeim point to as proof positive that college is meaningless. But the exceptions do not prove the rule. What does prove the rule is when a community packs a house to hear how to legally obtain government benefits. Really?! Is the l’chatchila dependence on Uncle Sam the best we can do as far as ambition towards living as a responsible Ben Torah? Somehow, the influential Rabbeim who never went to high school with a serious Limudei Chol curriculum, college, or held a job outside of a Yeshiva have become experts, have been career coaches and college advisors. Also, Yeshivos have become more specialized and elite. Much of it is about reputation. The parents capitulate early on with chinuch choices. Years later, many wonder what hit them. Yet, they want their children and grandchildren to only have the best and their role morphs into that of an ATM and giving tips on how to navigate the system. I would only add, in terms of the silver lining, that I do believe change will come and it will be bottom-up change (much as we’re seeing in E”Y). The Gedolim and the Askonim are NEVER going to come out and say, Go to college. Get a degree. Get educated. Nor is it their job to do so, I would argue. Nevertheless, there are many (though fewer than in previous generations) who do go to college, wear black hats, and are part of the American-Yeshivish world. They are not looked down upon (at least publicly) especially if they are seen in the beis medrash regularly, attend minyan 3x a day, give tzedakah, and are generally involved in tzorchei tzibbur. So the typical yeshiva guy, while hearing from his rabbeim that College is treif, nonetheless SEES these baaleibatim and their accomplishments and also SEES the struggles of others who did not go the college/education route, but also did not excel in Kollel and are therefore stuck in this muddle we are discussing. More important, many of the PARENTS of today’s generation are recognizing that this system won’t work for their kids and WILL send them to a TRUE Torah Im Derech Eretz high school, if such an option is available. Unfortunately, there are not many such options. But I believe there is a need and a “silent majority” looking for it. So the bottom line is, if you build it, I believe they will come. And the Leadership will not protest. i am glad you repeated what many dispute when i say it be’shem omro, the late prof. katz. he documents the occurrence of bottom – up change throughout jewish history, something the adherence to daas torah cannot abide. in today’s environment where chassidic rules of inheritance govern much of the yeshivishe infrastructure, this is even more obvious. Or do Gedolim and Askanim actually give candid, personally relevant advice to (or for) individuals in private but feel constrained to voice only their general preferences in public? Resulting mixed messages can lead people into needlessly conflicted lives and inappropriate decisions. It is not only in the kollel system but throughout Orthodoxy costs that are considered necessary must be examined to determine is that the basic requirement to be an ehrlicher, frum Jew, or are the expenses demanded nice hid due but a Cadillac expense. The vast majority of people don’t earn anywhere close to the amounts assumed that a frum person must earn to live in US frum community. I fully concur and can vouch that many such individuals are not exceptions to the rule in my community. Also agreed. The commenter’s inadvertent equation of “leaving Kollel = stopping learning'” speaks volumes, and, if that attitude is shared by many, gives one serious pause about the whole kollel enterprise. Is it meant to set a foundation for life, or is just a long honeymoon? Fortunately, the reality is that countless Jews spend their lives devoted to study, the vast majority of whom never took a Kollel check. Even those who have been to kollel report (I heard it from directly) that going out to work makes their now-limited amount of learning all the more focused and concentrated. The problem is that for many, if you are not learning full time you’re not really learning so why bother? One must also wonder: if God doesn’t want us to labour for a living, why did He give us so many mitzvos involving work? מה יעשה הבן ולא יחטא is the point that is being made. What are people supposed or do to earn a Parnassa? “Glatt Yosher” was a term coined by R. Breuer many, many years ago, if I’m not mistaken. If you think stealing is okay in any circumstances, shame on you. If you think demeaning others that don’t look like you, shame on you. If you think lying to certain people is okay, shame on you. If you think God was kidding or being picky when He said “Don’t steal” and “Don’t lie”, shame on you. And if you’re not feeling shame, shame on you! The main point is not a mass shaming exercise. It’s to show people caught up in this how to manage their affairs within the law. Next story Why Would American Orthodox Jews Fund a Campaign that Vilifies Them — and Israel?